The holiday season is one of the busiest times for many families, but it is also the most poignant of times with family and for making memories. There are many families who will have an empty seat at the dinner table this holiday season, for one who is away serving or for one who made the ultimate sacrifice. 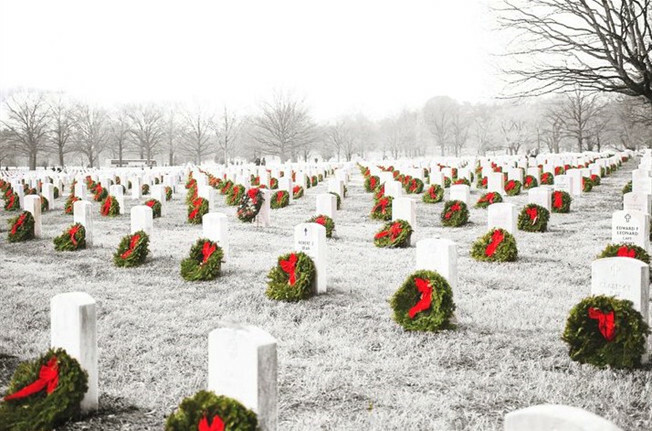 We think there is no better time of year to take the time, amid the hustle and bustle of the holiday season, to stop and count the blessing we enjoy in this land of the free - and to appreciate the high cost of freedom for which it was purchased. How do I go about getting a wreath for a loved one? To be clear, WAA cannot guarantee grave specific placements because we are an organization driven by volunteers. With that said, we have a number of volunteers who step forward to fulfill these kinds of requests. The last day to sponsor a wreath for 2017 is the Monday after Thanksgiving. Who is my location coordinator? How much does a wreath cost?